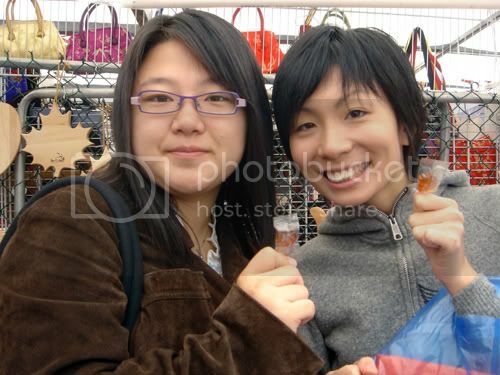 Here's me and Takae with the dream catcher. 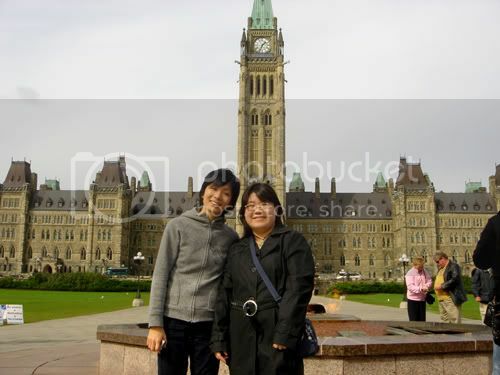 Then we headed to Parliament hill for politics central. 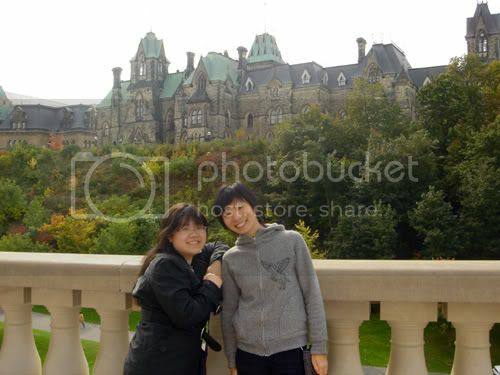 Takae wanted to meet Steven Harper, but the darn guy wasn't in that day (or at least we didn't see him). 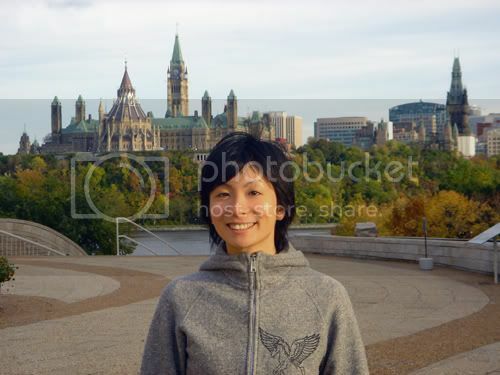 We did sit in on the Senate and House of Commons sessions, but photography in there wasn't allowed, so if you wanna see, you'll have to come up to Ottawa!!! 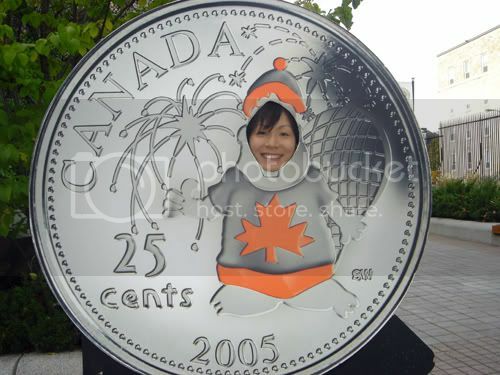 Then we headed to the Royal Canadian Mint where our money gets printed, and then the National Art Gallery. Finally, we crossed the bridge over to Hull to check out the Museum of Civilisation. On the bridge. That's the Ottawa river you see that separates the provinces of Ontario and Quebec as well as the cities of Ottawa and Hull. That big building with the round roof to the right of the high-rise is the museum. You get a good view of the back of Parliament Hill when you cross the bridge. The brown-roofed round looking building to the left of the Peace Tower is the National Library. AND OF COURSE DINNER!!!!!!!!!!!!!!!!! We wanted to go to Chinatown for hotpot, but it was already 9pm by the time we finished touring the museum, so we settled on a Japanese restaurant down the street from our apartment instead. Dinner was much fun with plenty of Kazuki-centred discussion headed by yours truly. 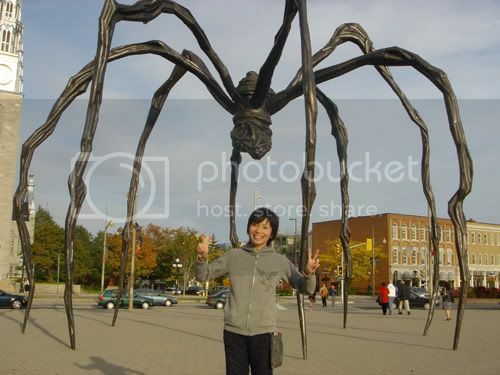 the creepy giant spider statue that's in front of the art gallery that just sounds wrong...-_-'...why the heck do they want to put a spider (of all things) infront of a building?? 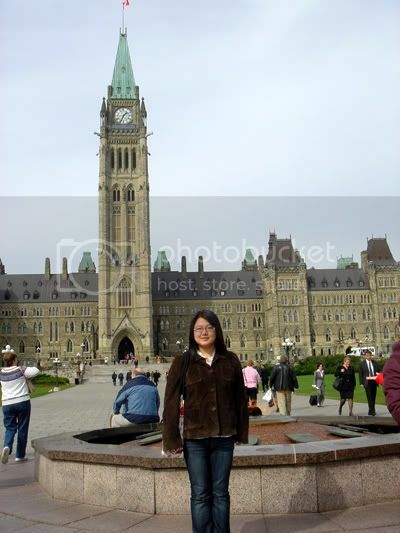 haha so cute XD and i get to see the parliament since i'll probably never go. and the food looks soooooooooooo delicious. Tell Takae she now has her very own fangirl. (then again, it'll probabky scare her, so don't. XD BUT SHE DOES LOOK GOOD).